The Futuna 57 was the first of the Futuna line of sail yachts and has exceptional sea-keeping qualities characterized by great directional stability downwind and very high average speeds on all points of sailing. Her fine entry lines enable her to point high in a seaway whilst also benefiting from maximum dynamic waterline length and reduced waterline beam when heeled. The wide stern sections associated with the twin-rudder configuration are notable for the excellent helm control they allow at speed, even in the most extreme planning conditions. The modern 9/10 fractional rig is fitted with a carbon-fiber mast and boom. 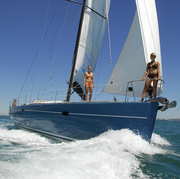 For blue water cruising, the volume of the hull easily accommodates the load necessary for extended voyages, whilst the concentration of the accommodation near the center of the hull combined with a very low center of gravity, limits pitching, and makes the boat stiff under sail, guaranteeing a seaworthy boat that is safe and comfortable in all conditions. 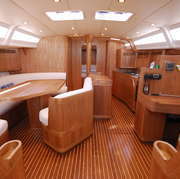 Space in the cockpit is generous and life at sea and in harbor is made easier by the careful thought that has gone into allowing ease of movement around, in particular with the mainsheet track on cockpit sole. The owner's cabin forward has its own head compartment with a separate shower stall. Each of the guest cabins aft also has its own head. Particular attention has been paid to the insulation of the aluminum hull and to the ventilation down below provided by numerous opening hatches and ventilators to complement. The composite sandwich deck, as well as keeping the boat as light as possible provides more thermal insulation that would an all-aluminum structure. 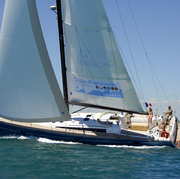 This 57' sail cruiser provide ample storage space for all equipments needed for a long distance trip in full autonomy.